Jennifer Stenander is the new vice president for Enrollment Management at Middle Georgia State University. Stenander, 44, originally from Monticello, Ga., joined Middle Georgia State on August 1, 2018. Most recently the founder and president of an enrollment management consulting firm, she has more than 20 years of experience in admissions, recruitment, supervising, marketing, management, strategic planning, budgeting, executive administration, enrollment and retention. "I'm excited to be part of a vibrant University that is having such a profound impact on central Georgia and beyond," Stenander said. "I look forward to leading a team that opens doors to prospective students and helps guide them toward successful futures." As vice president for Enrollment Management, Stenander will lead Middle Georgia State staff members who work in orientation, admissions, financial aid, registration, marketing and communications, and the customer service call center. 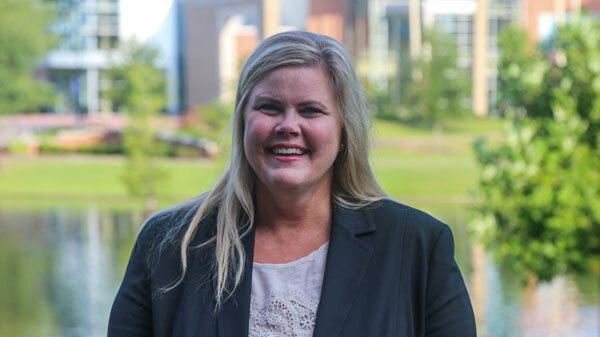 She will take the lead role in developing strategies to increase and manage enrollment and work with other University departments on ways to help more students stay on track and graduate. Stenander is president of Stenander Consulting Group, which has worked with Middle Georgia State, Columbus State University, Gordon State College and Georgia Highlands College to help them increase enrollment. Prior to founding the consulting firm in 2016, Stenander was associate vice president for Enrollment at the University of North Georgia. Earlier in her career Stenander worked at Georgia Southern University as assistant director of Undergraduate Admissions and as a public affairs officer for the Georgia Emergency Management Agency/Homeland Security. Stenander holds a master of public administration and bachelor's degree in education from Georgia Southern. She has done additional graduate work in educational policy and leadership from Georgia State University and student affairs leadership from the University of Georgia. She was a 2011 Summer Fellow at the Peabody Professional Institute for Higher Education Management at Vanderbilt University and selected for the 2012 Summer Institute on College Admissions at Harvard University. Stenander and her husband, Chris, have three children. Middle Georgia State University (MGA) serves about 7,400 students on campuses in Macon, Cochran, Dublin, Eastman, and Warner Robins, and online. Students can choose from dozens of programs— including business, nursing, information technology, new media and communications, and contemporary musicianship — that lead to bachelor’s degrees. MGA also offers professional master’s degrees in cybersecurity, nursing, management, and secondary education, with other graduate programs under development. The University is home to Georgia’s only public school of aviation—based on the Eastman campus—and a four-year degree in flight. Student housing is available on the Macon, Cochran, and Eastman campuses. More information is at www.mga.edu.